Every month, Fulbridge interviews an ETA from around the world to get a glimpse of what life is like in different placements. This month, Samantha Steiner, a 2017 ETA in Argentina, and Lisa Gagnon, a 2017-2018 ETA in Latvia, talked with Lara Hawley, an ETA in South Africa. I chose South Africa for several reasons. First of all, I had traveled to Africa three times prior to applying to the Fulbright program and fell in love with the beauty of the continent. I knew that, if given the opportunity, I wanted to return for an extended period of time to teach and fully immerse myself in a community. I chose South Africa specifically due to their history of Apartheid. Both South Africa and America have similar histories with race relations and I wanted my experience in South Africa to help my future teaching career in the inner cities of America. How is South Africa different from the U.S.? The biggest differences I have noticed between South Africa and the U.S. have been the interpretation of time and the segregation of races. Time here in Africa is a lot less of a concern. I grew up on the East Coast where everyone is constantly rushing and if you show up five minutes early for an event you are already considered late. Being timely is a major way to show people you are serious about a job in the States and it helps to get things done efficiently in the workplace. However, in South Africa everyone runs on “African time,” where showing up twenty minutes late is considered early. People here value meaningful interactions with others and being present in the moment. Therefore, being late to other events or obligations is common. This lenient interpretation of time is beautiful and inspirational but it does get frustrating since I did not grow up working in this sort of environment. Could you describe your experience navigating issues of race, gender, or sexuality in South Africa? Navigating race relations in South Africa has been something that is a part of my daily life. I am living in the northeastern province of Limpopo, which is a more rural area and therefore less advanced than some of the big cities in South Africa. The communities here are all still very segregated (a lasting effect of the Apartheid era). The school that I work at is located within a village and all of my learners are black. Within the city I am staying in, each neighborhood is either all black or all white with few to no exceptions. On one of the first days at my school, my learners asked me if I spoke to black people in America, and it took weeks for the students to come up and talk to me on their own instead of simply staring in shock. Everyone that learns I am teaching in the village has trouble believing it due to the fact that everyone in the village is black and I am white. A lot of conversations I have with white South Africans circle around phrases like “I’m not racist but….” and all of the groups of friends I’ve made have been either all white or all black with no exceptions. The segregation that still exists here astonished me. I knew that dealing with race would be a major part of my life here in South Africa but I did not expect it to be to this extent. That being said, I am doing the best I can to break down others’ prejudices and push back on people’s pre-existing notions of race. I know I cannot solve racism in South Africa, but I hope that I can get a few people to question their current ideas of race and interacting with those that are different from them. A typical weekday consists of getting up at 6:00 am to get ready for school and then driving an hour out to the village that I work in. During the school day my responsibilities vary depending on the day of the week. Some of the things I am involved in are: coaching the debate team, holding small group lessons for the students struggling with English, teaching extra English classes to allow students to have a more relaxed setting to practice their English, and observing other teachers lessons. After school I make my commute back home, go to the gym, cook dinner and go to bed. How do you connect to your community outside of your formal responsibilities? The biggest way I connect to my community outside of my formal responsibilities is by simply interacting with as many people from South Africa as I can. In addition to teaching, I am also here to exchange ideas and cultures with others. I think it’s important to have meaningful genuine conversations about the world with others in my community. By both communicating my own beliefs and listening to others I can not only grow and develop as a person but also help others do the same. What are some of the challenges you’ve encountered as an ETA? Some of the challenges I have encountered are: class sizes of 60+ students, a more teacher-centered education system, navigating my role in the school, finding an apartment, buying furniture, and adapting to the concept of African time. Things are much more relaxed here in regard to time, so getting used to the fact that meetings and classes at school do not occur when they are technically supposed to has been a major adjustment. Teachers will often show up twenty minutes late to class and thus I’ve had to practice my patience and make peace with waiting for things to happen. 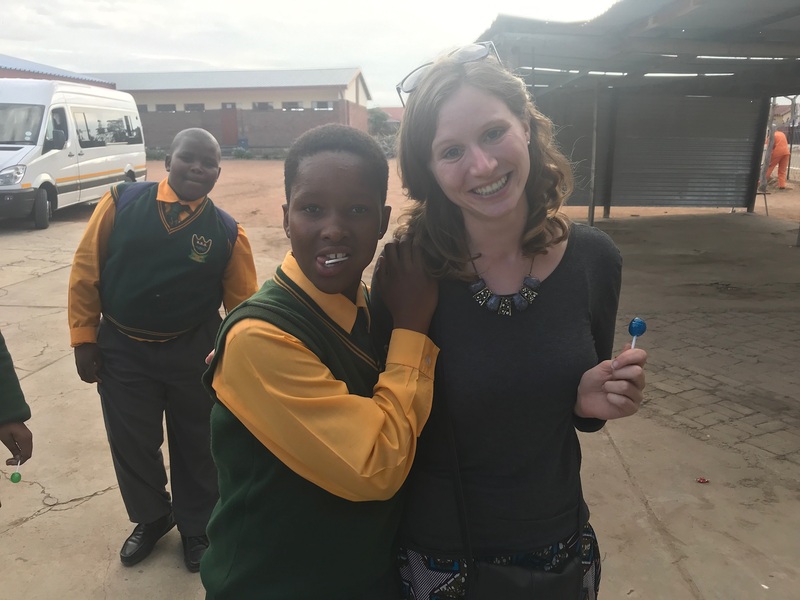 Some of the highlights of my time in South Africa include interacting with the people in my community, traveling, and spending time with my learners. It has been so beautiful watching the improvement of the students I have been working with in just the two months I have been at the school. The students have gone from simply staring at me to coming up to me and talking to me about their days. The learners in my small groups have gone from sitting quietly with their heads down to laughing and openly participating in the lessons. The students in debate are talking and sharing stories from their lives with us. I love getting to know each and every student and learning and laughing alongside them. Why should prospective grantees apply to work in South Africa? The better question is, “Why shouldn’t grantees apply to work in South Africa?” There are countless reasons why I would recommend this experience to people. South Africa is such a beautiful and diverse location, from its people to its landscapes. You can soak up the sun on the beaches of Durban, go on a safari in Kruger National Park, educate yourself about the rich and brutal history at The Apartheid Museum in Johannesburg, or climb Table Mountain in Cape Town. There are eleven official languages and countless cultures and traditions. This country has so much to offer and I believe that one can only scratch the surface by being here for nine months. However, it will also be challenging and you will have to constantly push yourself. But I believe that if you are going into this experience you should want to be challenged in order to help yourself change and develop as a person. How have your experiences in South Africa changed you? I think that it has made me think more critically about the world around me. I’ve become more aware of the struggles of people outside my bubble of Connecticut back home. It has caused me to be even more open minded to different ways of life and different cultures. It has taught me to listen first and speak second. I’ve also learned to be independent in a new environment. It has taught me to slow down, to enjoy every moment, and reflect on my life as much as possible. I have only been here two months but have already had so many life altering experiences. If you are considering applying to Fulbright, just do it. Don’t second guess yourself. It is an absolutely amazing and once-in-a-lifetime experience. Not everyone is lucky enough to live in another country for an extended period of time and if given this opportunity you should take it and enjoy every second. Lara Hawley is from Woodbury, Connecticut. She graduated from The University of Connecticut in 2016 with Bachelors degrees in both Secondary English Education and English. She then graduated in 2017 from The University of Connecticut with her Masters degree in Curriculum and Instruction. After her grant term, she plans to begin her high school English teaching career in the States.